The Warsaw Declaration is the founding document of the Community of Democracies, signed on June 27, 2000, in Warsaw, Poland. It defines the essential practices and norms for the effective establishment of democracy and emphasises the interdependence between peace, development, human rights and democracy. 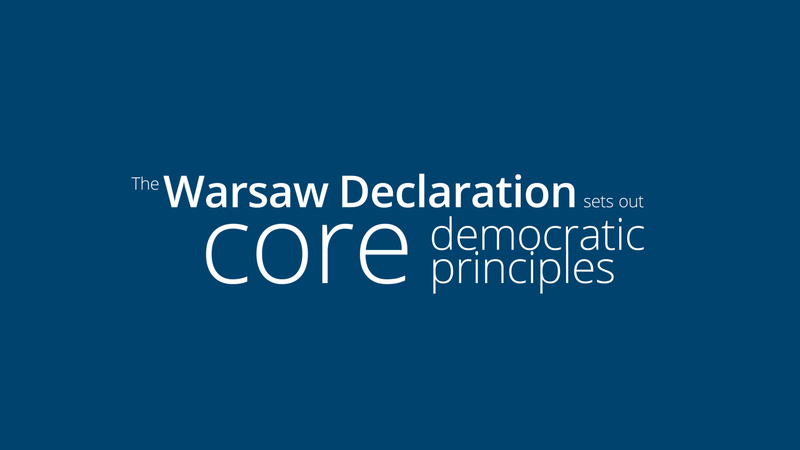 Signatories of the Warsaw Declaration recognised the universality of democratic values and committed to respect and uphold its 19 core democratic principles. In line with the CoD’s Strategic Plan 2018-2023, the Governing Council Members cooperate to encourage adherence to Warsaw Declaration principles in countries within and outside the Community. Utilizing Governing Council meetings as a platform for discussion and dialogue among Member States and other democracy stakeholders on substantive policy issues as well as proposed diplomatic actions for the Governing Council’s consideration. Consultations with experts– distinguished leaders, civil society leaders, former diplomats and renowned academics on issues of particular concern to the Governing Council. Concerted actions by the Working Group on Enabling and Protecting Civil Society in response to particularly concerning situations. Diplomatic responses – including demarches, dialogue, and actions in other fora like the UN General Assembly and Human Rights Council – to discourage democratic backsliding and encourage the protection of the values and principles of the Warsaw Declaration.